Take curd- put it in a sieve to drain out the water for about 15-20 minutes. Take a big bowl, add cabbage, tomato, cucumber, capsicum, salt, pepper, chaat masala, cheese and mix it well. Add curd and mix it well. Put it in the refrigerator to make it cold. Take buns, cut into half and apply butter. Apply green chutney on both the halves, put about 2 tablespoon of cold salad, cover it with other half and serve it. 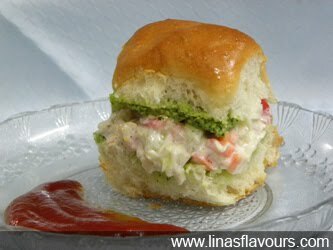 You can even use burger buns instead of bhaji buns.